Let's cut to the chase and talk about what really matters for the largest bank in the U.S. by assets. JPMorgan Chase (NYSE:JPM) is a huge and vastly complex bank. But don't let that fact overwhelm you. In the next five minutes you'll have everything you need to know about the company and its stock. JPMorgan Chase is the largest U.S. bank by assets, and it's also one of the most complex and diverse. While other mega banks may have a relatively narrow focus, JPMorgan does it all. It calls this the "universal banking model." Wells Fargo (NYSE:WFC), for example, is a mega bank with nearly $1.8 trillion in total assets, but its operations are more similar to a regional bank than to JPMorgan. Wells originates loans like mortgages, collects deposits like saving or checking accounts, and helps consumers with their retirement and brokerage needs. That's largely it. Goldman Sachs (NYSE:GS) is another mega bank with a more singular focus, except it's the polar opposite of what Wells Fargo does. Goldman is an investment bank through and through, with huge trading operations, advisory services, and exposure to real estate, securities, derivatives, and other more esoteric financial niches. It has some exposure to mortgages and it does accept deposits, but at its core Goldman is an investment bank. JPMorgan, which reported total assets of $2.35 trillion as of the fourth quarter, has a huge lending and deposit business like Wells plus a leading investment banking business like Goldman. Based on loans outstanding, JPMorgan is the largest credit card issuer in the U.S. It's also the second largest mortgage loan originator. It originated $1.6 billion in business loans during the fourth quarter alone. At the same time, and on the opposite end of the spectrum, JPMorgan ranked first in global investment banking fees for 2015. In the fourth quarter alone its corporate and investment banking division earned over $1.7 billion in profits. Why does JPMorgan try to do it all? First, the bank is able to take advantage of cost and productivity synergies across its businesses that are not possible for smaller or more narrowly focused business models. In the bank's investor day presentation last year, the bank estimated that the universal banking model produced $15 billion in annual revenue synergies and $3 billion in annual cost synergies. That's huge dollars, even for a $2.35 trillion bank. Second, the diversity of JPMorgan's business is designed to provide a steadying force to the bank's earnings throughout the credit cycle. If the lending business has a bad year or quarter, the theory goes that its other corporate, asset management, and investment banking divisions would pick up the slack. Over time, this model can provide more consistent and predictable earnings, a big plus for investors. The universal banking model is also a component of JPMorgan's larger risk strategy, one built on top of its diehard adherence to a concept called the "fortress balance sheet." The fortress balance sheet is JPMorgan's term to describe the need for a bank to constantly focus on maintaining the resources on hand to survive and thrive in any economic environment. It means always managing liquidity prudently and ensuring that there is enough capital on hand to weather any storm. During the financial crisis, banks with lesser risk management cultures stumbled and failed. Bank of America (NYSE:BAC) was forced to take a bailout from Warren Buffett. Goldman Sachs did the same. Other stalwart banks like Wachovia, Bear Stearns, and Lehman Brothers disappeared altogether. JPMorgan did not just survive the crisis, it in many ways thrived. The universal banking model does have its drawbacks, notably an increased regulatory burden, but we'll dive into that a bit deeper when discussing the bank's valuation. 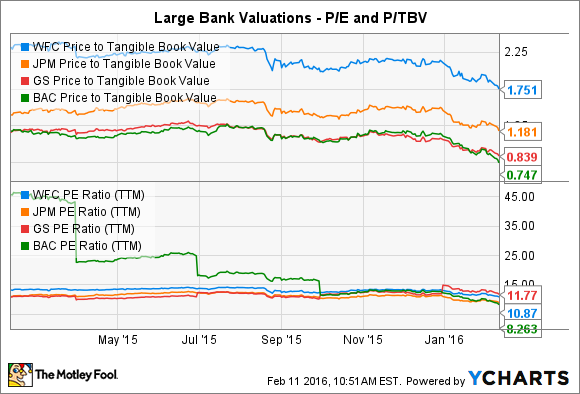 Two of the best and most common ways to value a bank stock are by the price to earnings ratio (P/E ratio) and its price to tangible book value ratio (P/TBV ratio). Price to earnings measures the value of the bank relative to the profits it generates, while the price to tangible book value ratio measures the market value relative to the net worth the company reports on its books according to accounting rules. A higher P/E ratio indicates the market has more confidence in a company's earnings going forward. P/TBV ratios tend to come into focus and swing lower during contracting economic cycles as investors grow unsure of the write downs and loan losses banks may take for bad loans during these periods. On a price to earnings basis, JPMorgan is relatively cheap compared to the other large bank competitors we've discussed here. Wells Fargo and Goldman each enjoy a higher P/E ratio, while Bank of America lags the industry thanks to its weaker earnings and recent history of problems. Wells Fargo leads the pack in terms of price to tangible book value, indicating that investors have more faith in the assets on Wells' balance sheet. Goldman trails by this measure, and Bank of America again brings up the rear. JPMorgan is categorized as one of the most important global financial institutions by regulators. This classification requires the bank to maintain a higher level of capital than its U.S. competitors, which increases the bank's costs and capital requirements above the other U.S. megabanks. That reality reduces the bank's overall profit potential and is a major reason why investors discount the bank on a price to earnings basis compared to other large, but less systemically important banks like Wells and Goldman. And here we are, five minutes later, and you have all the critical information you need to understand exactly what makes JPMorgan Chase tick.